The idea that the American Great Plains and the Canadian Prairies are just “fly-over” country is a mistake. In the post-9/11 era, politicians and policy-makers are paying more attention to the region, especially where border enforcement is concerned. 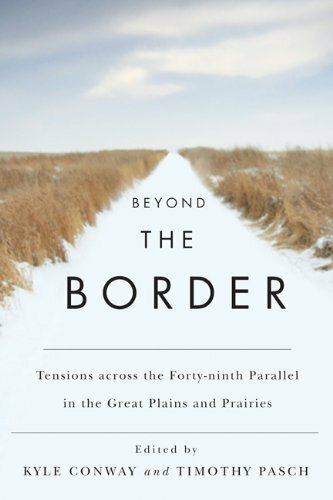 Beyond the Border provides interdisciplinary perspectives on the region’s increasing importance. Drawing inspiration from Habermas’s observation that certain modern phenomena – from ecological degradation and organized crime to increased capital mobility – challenge a state’s ability to retain sovereignty over a fixed geographical region, contributors to this book question the ontological status of the Canada-US border. They look at how entertainment media represents the border for their viewers, how Canada and the US enforce the line that separates the two countries, and how the border appears from the viewpoint of Native communities where it was imposed through their traditional lands. Under this scrutiny, the border ceases to appear as self-evident, its status more fragile than otherwise imagined. At a time when the importance of border security is increasingly stressed and the Great Plains and Prairies are becoming more economically and politically prominent, Beyond the Border offers necessary context for understanding decisions by politicians and policy-makers along the forty-ninth parallel. Contributors include Phil Bellfy (Michigan State University), Christopher Cwynar (University of Wisconsin), Brandon Dimmel (Western University), Zalfa Feghali (University of Nottingham), Joshua Miner (University of Iowa), Paul Moore (Ryerson University), Michelle Morris (University of Waterloo), Paul Sando (Minnesota State University Moorhead), and Serra Tinic (University of Alberta). The UND Borderlands Institute will serve as a clearinghouse, motivator, information exchange center, and resource for faculty, community members, campus and community organizations, and businesses desiring to pursue projects focused on Canada. Goals and objectives are as follows: •	The Institute will develop, support, and enhance curricula focused on border issues. •	The Institute will encourage, develop, and support research and scholarship about border issues and/or involving cross-border collaboration. •	The Institute will encourage and support cross-border cultural exchanges. •	The Institute will encourage and support collaboration around problems related to border issues or problems that are intrinsically cross-border. •	The Institute will encourage interactions that could support or lead to economic collaboration. •	The Institute will promote cross-border agreement on issues of common interest.